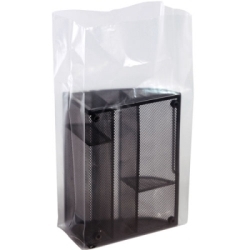 6" x 3" x 15" 2 Mil Polyethylene Gusset Bags | U.S. Plastic Corp. These clear polyethylene bags are ideal for storing or shipping a wide variety of bulk materials, equipment, and parts. They make contents visible, yet protect and contain them. Features deep accordion folds on each side that expand. Meets FDA standards and are sold in cases only. Dimensions are listed W x D X L.